The bell rings and the dog starts drooling. Such a reaction was part of studies performed by Ivan Pavlov, a famous Russian psychologist and physiologist and winner of the Nobel Prize for Physiology and Medicine in 1904. His experiment, nowadays known as “Pavlov’s Dog”, is ever since considered as a milestone for implicit learning processes. 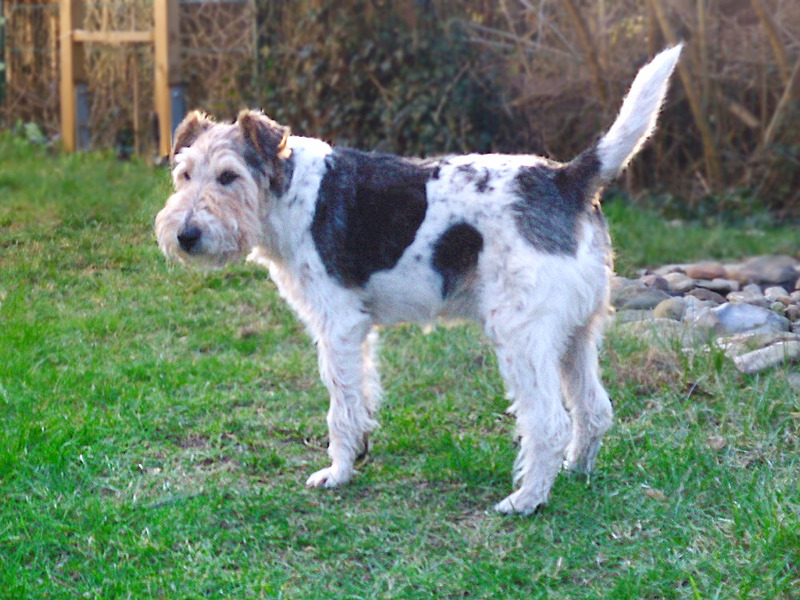 By using specific electronic components scientists form the Technical Faculty and the Memory Research at the Kiel University together with the Forschungszentrum Jülich were now able to mimic the behavior of Pavlov`s dog. The study “An Electronic Version of Pavlov’s Dog” is published in the current issue of Advanced Functional Materials (huwp 12012). Digital and biological information processing are based on fundamentally different principles. Modern computers are able to work on mathematical-logical problems at an extremely high pace. In fact, procedures in the computer’s central processing unit and in the storage media run serially. While digital computers have shown immense success throughout the years in certain fields, they reveal weaknesses when it comes to pattern recognition and cognitive tasks. “However, to imitate biological information processing systems recognition and cognitive tasks are essential. Mammal brains – and therefore also the brains of humans – decode information in complex neuronal networks of synapses with up to 1014 (100 Trillion) connections. However, the connectivity between neurons is not fixed. “Learning means that new connections between neurons are created, or existing connections are reinforced or weakened”, says PD Dr. Thorsten Bartsch of the Clinic for Neurology. This is called neuronal plasticity. Is it possible to design neural circuits with electronic devices to mimic learning? At this crossroad between neurobiology, material science and nanoelectronics, scientists from the University of Kiel are collaborating with their colleagues from the Research Center Jülich. Now, they have succeeded in electronically recreating the classical “Pavlov’s Dog” experiment. “We used memristive devices in order to mimic the associative behaviour of Pavlov’s dog in form of an electronic circuit”, explains Professor Hermann Kohlstedt, head of the working group Nanoelectronics at the University of Kiel. Memristors are a class of electronic circuit elements which have only been available to scientists in an adequate quality for a few years. They exhibit a memory characteristic in form of hysteretic current-voltage curves consisting of high and low resistance branches. In dependence on the prior charge flow through the device these resistances can vary. Scientists try to use this memory effect in order to create networks that are similar to neuronal connections between synapses. “In the long term, our goal is to copy the synaptic plasticity onto electronic circuits. We might even be able to recreate cognitive skills electronically”, says Kohlstedt. The collaborating scientific working groups in Kiel and Jülich have taken a small step toward this goal. The project set-up consisted of the following: two electrical impulses were linked via a memristive device to a comparator. The two pulses represent the food and the bell in Pavlov’s experiment. 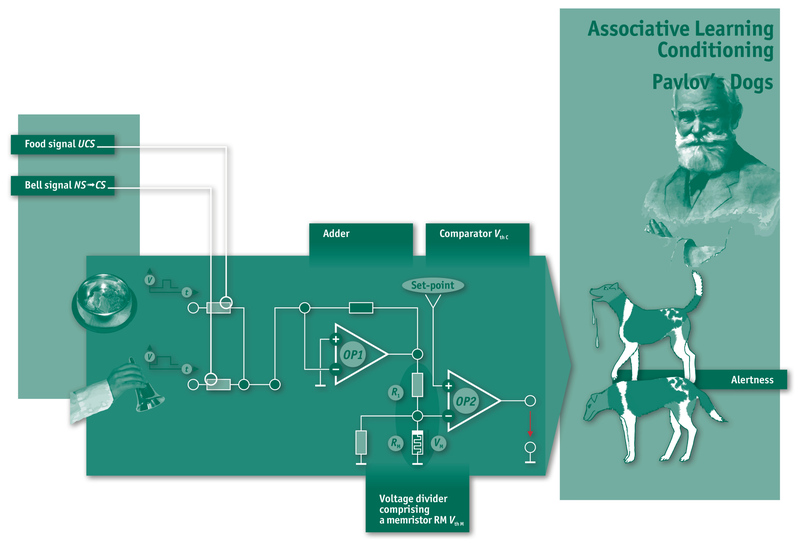 A comparator is a device that compares two voltages or currents and generates an output when a given level has been reached. In this case, it produces the output signal (representing saliva) when the threshold value is reached. In addition, the memristive element also has a threshold voltage that is defined by physical and chemical mechanisms in the nano-electronic device. Below this threshold value the memristive device behaves like any ordinary linear resistor. However, when the threshold value is exceeded, a hysteretic (changed) current-voltage characteristic will appear. 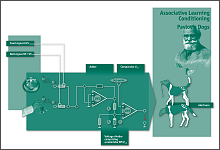 “During the experimental investigation, the food for the dog (electrical impulse 1) resulted in an output signal of the comparator, which could be defined as salivation. Unlike to impulse 1, the ring of the bell (electrical impulse 2) was set in such a way that the compartor’s output stayed unaffected – meaning no salivation”, describes Dr. Martin Ziegler, scientist at the Kiel University and the first-author of the publication. After applying both impulses simultaneously to the memristive device, the threshold value was exceeded. The working group had activated the memristive memory function. 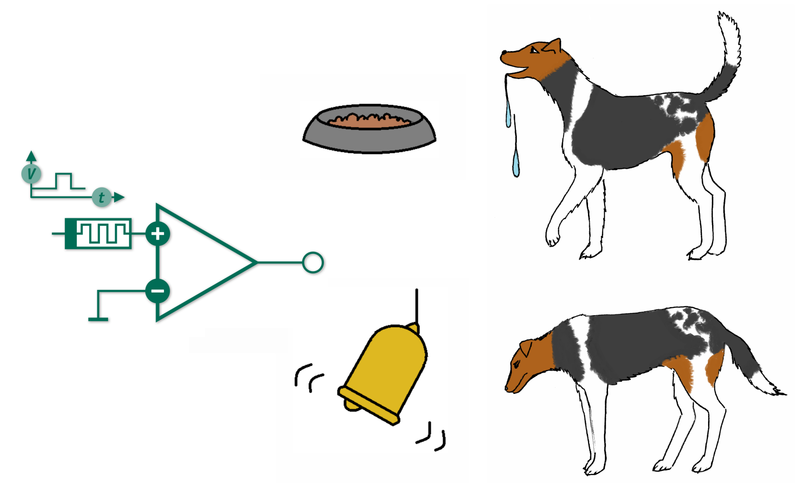 Multiple repetitions led to an associative learning process within the circuit – similar to Pavlov’s dogs. “From this moment on, we had only to apply electrical impulse 2 (bell) and the comparator generated an output signal, equivalent to salivation”, says Ziegler and is very pleased with these results. Electrical impulse 1 (feed) triggers the same reaction as it did before the learning. Hence, the electric circuit shows a behaviour that is termed classical conditioning in the field of psychology. Beyond that, the scientists were able to prove that the electrical circuit is able to unlearn a particular behaviour if both impulses were not longer applied simultaneously. 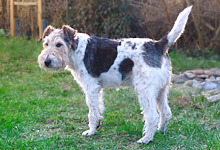 In Behavioural Psychology, Pavlov’s experiments with dogs are considered as milestones to understand implicit learning in biological systems. In the early 20th century, Ivan Pavlov was able to show that dogs reacted indifferently towards the impulse “bell” and “food” when these were presented separately. After combining those two impulses (food and bell) in multiple repetitions, the dogs associated both impulses with each other. As a result, the dogs produced a higher amount of saliva, now even hearing the bell alone. This method is called classical conditioning and can be generalized to various combinations of certain impulses. Caption: The experiment called “Pavlov’s Dog” shows that acoustic stimulations can cause physical reactions. Scientists of Kiel University redesigned this mental learning process. Caption: Kiel scientists teach electronic circuits to memorize reactions. Caption: Nanotechnology scientists and memory researchers have published research results concerning “Pavlov’s Dog”.